Forget Christmas cookies - bring on the Christmas cupcakes instead! Getting together with family, friends, and kids around the holiday season is a great excuse to be creative with the combination of cake, frosting, and decoration that cupcakes require. As long as you keep them in the pan or transfer them to a carrying case, cupcakes also make a fun addition to holiday cookie exchanges. Embrace the chilly white stuff and show how pretty it can be by using it in your cupcake decorations. While your cupcakes are baking, melt about 1 cup of white chocolate chips with 1 tablespoon of vegetable shortening in a double boiler. Whisk until the mixture is completely smooth. Let it cool slightly, then transfer it to a pastry bag with a round piping tip. On a sheet of wax paper or parchment paper set over a baking sheet, pipe out snowflake shapes with the white chocolate mixture. Before the snowflakes dry, sprinkle them with granulated sugar. Refrigerate the snowflakes until they are firm. Top your cooled cupcakes with sheets of white fondant or coat them with white buttercream. Lightly stick a white chocolate snowflake on top of each cupcake. Sprinkle edible glitter or luster dust on the flakes to finish. If you want to add a little color to your cupcakes, use blue, red, green, or periwinkle frosting below the sparkling snowflake decoration. Snowmen are a classic holiday theme and also one of the simplest for Christmas cupcake decoration. Roll out tinted fondant frosting and apply it to coat the top of cupcakes with a dab of buttercream spread underneath. Roll out a big sheet of white fondant and use small, circular fondant cutters, cookie cutters, or a sharp knife to cut very small circles from the fondant. Place three circles on each cupcake. Decorate the snowmen with a brush and edible paint. Try stacking cupcakes to create a larger snowman! 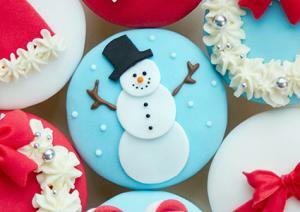 For each snowman, you'll need two regular-sized cupcakes and one mini cupcake. Take cupcakes out of their wrappers and use a sharp, serrated knife to shave off edges until each cupcake is shaped roughly like a sphere. Arrange cupcakes vertically in sets of three, with the bigger cupcakes at the bottom and the mini cupcake at the top. Stick a dowel or chopstick through the cupcakes so they stay together. Frost the cupcake snowmen generously with white buttercream. Sprinkle sweetened flaked coconut over the frosted cupcakes. To finish the snowmen, stick in small black candies for eyes and a small length of pull-and-peel red licorice for a nose. If you don't have dowels and want to keep your cupcakes wrapped, you can also make snowmen by just laying cupcakes next to one another. Ice all of your cupcakes with white buttercream. Arrange three cupcakes on a platter or serving tray so that they are touching and form a vertical line. On the bottom and center cupcakes, stick two Red Hots or red chocolate candies. These serve as buttons on the snowman's "coat." At the top of the middle cupcake, arrange a piece of pull-and-peel licorice or a thin piece of fruit leather to look like a scarf around the snowman's neck. The top cupcake is the snowman's head. Stick in two chocolate chips for eyes and a slice of carrot or orange jelly candy for a nose. If you like, you can add a chocolate wafer cookie to serve as a stovepipe hat. Frost your cupcakes with a buttercream that matches your Santa's skintone. Create and apply a bushy white beard for each cupcake with a handful of mini marshmallows--just stick them directly into the buttercream. Use two small candies or mini chocolate chips for eyes. Add a bright red hat on top of the cupcake, using either red buttercream or fondant. Finish by using a mini marshmallow for the tip of Santa's hat. If you like, you can also use edible ink to draw a mouth curved into a smile. 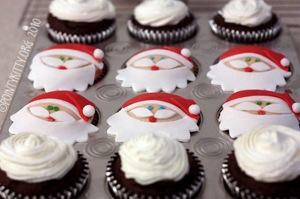 Create just a Santa face on each cupcake by placing cut fondant layers on top of the cakes. Frost a base layer in buttercream and add small candies for facial accents. Make small fondant Santa figures (sculpting the figures might be especially fun for kids who like to play with clay). Place a tiny fondant Santa in a sleigh on one cupcake with reins leading through several other cakes to reindeer on the remaining cupcakes. Shape the reindeer by using a sharp knife or a kitchen scissors. Recreate your Christmas tree in miniature, edible form! Put a leaf tip onto the end of a regular piping bag filled with light green icing. Beginning at the top of your cupcake, pipe out pairs of short lines with the leaf tip, forming triangular shapes. Extend the lines as you continue down the cupcake, forming an evergreen tree shape that widens at the bottom. Stick a chocolate chip at the bottom of the tree to serve as a trunk. 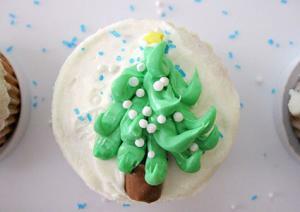 Decorate your cupcake tree with icing in a different color using a small, round tip. Add small candies to represent ornaments. These little cupcakes would be fun to spread out around the sides of a larger, tree-shaped cake. Take each cupcake out of its wrapper and carve it into a cube shape with a sharp, serrated knife. Save scraps to make cake pops or another treat. Ice the sides and tops of the cubed cupcakes with a thin layer of brightly colored buttercream. Leave the bottoms unfrosted. 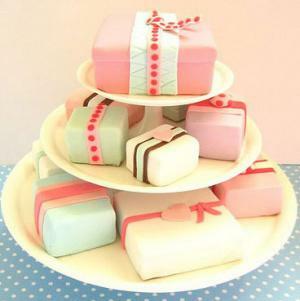 "Wrap" your gifts with a fondant ribbon or top them with a fondant bow. Stack the presents with other cupcake gifts after the icing dries. Basic designs might be enough to get you started, but the real fun begins when you're comfortable deviating from the norm and trying new ideas. To start your brainstorming session, try looking at a series of Christmas cupcake pictures and picking out those you like best. Make tiny holly leaves from buttercream, marzipan, dyed sugar cookie dough, or fondant. 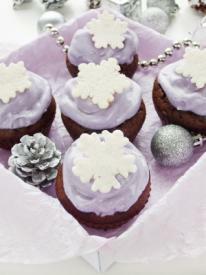 Alternatively, use a Christmas cake stencil to make a small leaf decoration on a cupcake. Pipe on small red berries with frosting to accompany the leaves. 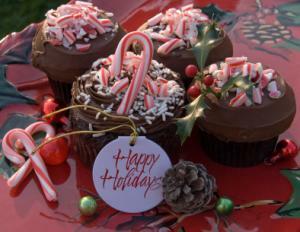 Decorate each cupcake as an ornament, or place real holiday ornaments on top of cupcakes. For a Sunday school class or religious event, decorate cupcakes with a manger theme. Tiny fondant donkeys, pigs, and even wise men can top the cakes. Frost cupcakes with white buttercream, and add red and green sprinkles. Ice cupcakes with ivory, blue, and silver frosting, then sprinkle with edible glitter. Place a small Christmas cookie on top of each frosted cupcake. Use mini candy canes as cupcake toppers. If you want to decorate Christmas cupcakes with your kids or with friends who don't have a lot of cake decorating experience, it's a good idea to keep things fairly simple. Remember, the memory of decorating cupcakes together is more important than having them look like they came from a fancy bakery.